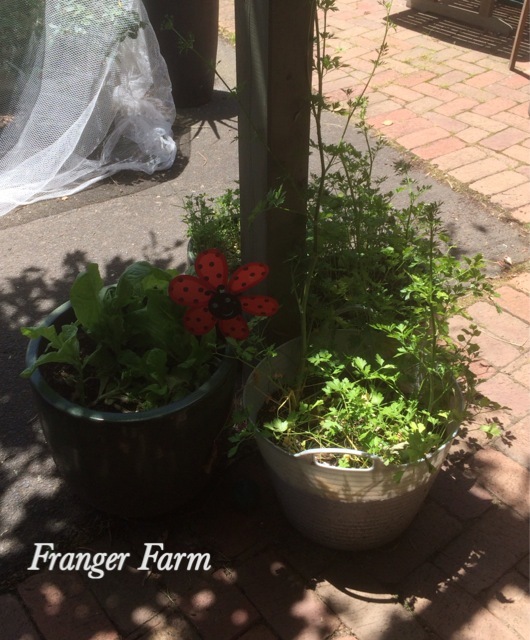 Growing food on paved areas. 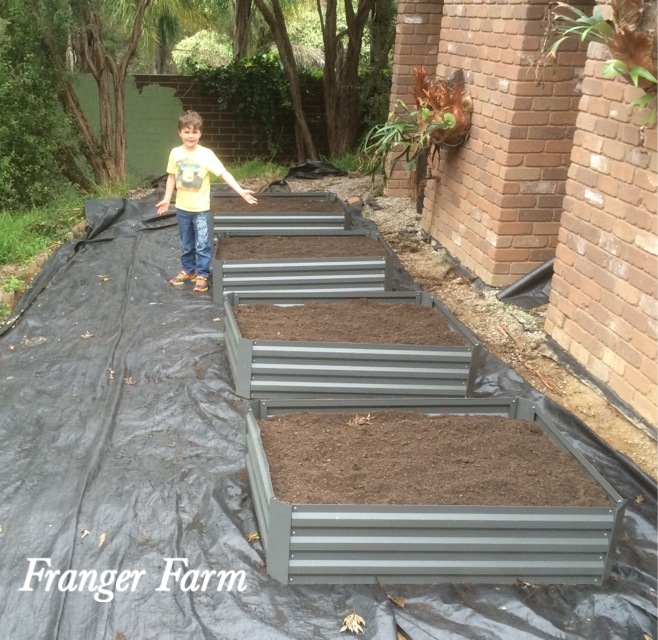 If you’re not ready to sacrifice your lawn for a veggie patch or you’ve simple run out of space, don’t despair, you may be overlooking some areas that can quickly be converted into food growing oases. Here’s a guide to how we use the paved areas around our home for growing food, it may give you a few ideas. 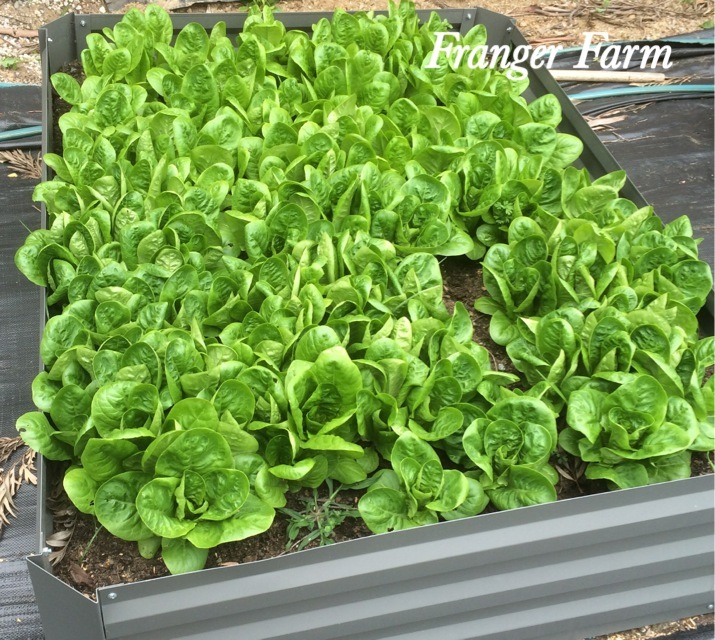 You can grow most veg in a raised bed. Our house can loosely be described as ‘ranch style’ and it is paved or gravelled all the way around. At the back of the house we have seven raised beds growing herbs and vegetables. Adding ready made raised beds is a really quick way to turn a paved area into a growing bed. Adding some more raised beds at the back of the house. When we added our latest beds, the area had been covered with weedy gravel, we took it back to dirt, then weed matted the entire area before placing the beds on top, our next job is to add some new gravel around the beds. As soon as the beds are filled with soil, they are ready for planting and they can be placed direct on to concrete or pavers. So you see how quick it is to convert a paved area without any major alteration and not a huge expense either. A few large pots can also be turned into an instant herb or vegetable garden, we have quite a few dotted round the place, they are great for use on balconies as well. 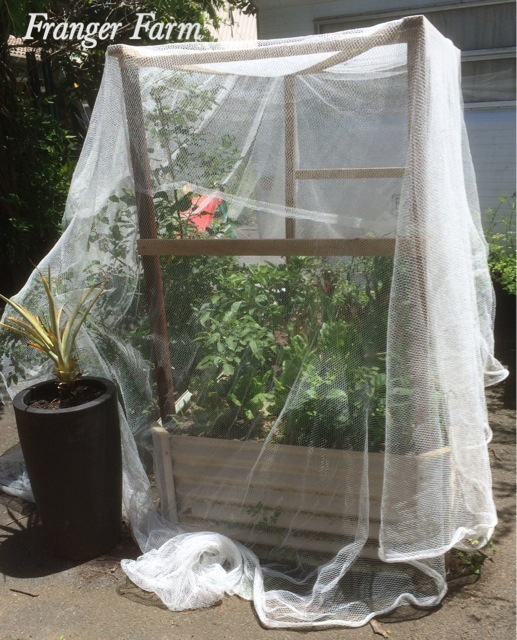 Make a frame for nets to keep pests out. At the front of the house we have a large bed that is deeper than the others, this gives us more options when it comes to planting time. We’ve also added frames to some of our raised beds so that they can be netted to keep the pests out. It’s not essential to buy ready made raised beds, the same can be achieved with four pieces of wood joined together to form a bed, or with any large container such as an old apple crate. 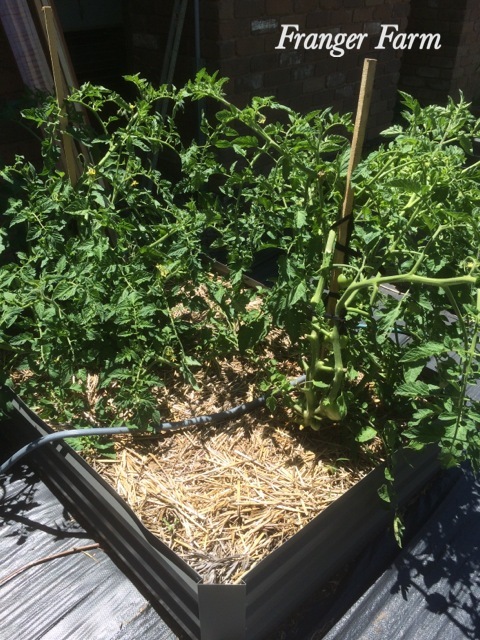 Tomato plants in a raised bed. As these beds are so close to the house, we like to use them to grow the things we use the most, like herbs and salad items, it’s so quick and easy to make a salad if you only have to step a few feet out of the door of your house to grab the things you need, and we never have to trek to the supermarket to pick up fresh herbs. So take another look at the areas around your home, maybe you have got space to grow some food after all? Categories: growing fruit and veg, suburban farming Tags: backyard farming, gardening, growing vegetables, raised garden beds, Suburban farm. We started small, with one little veg patch and a few tomato, lettuce and sweetcorn plants grown from seedlings. That spring was very wet and the summer not especially warm. 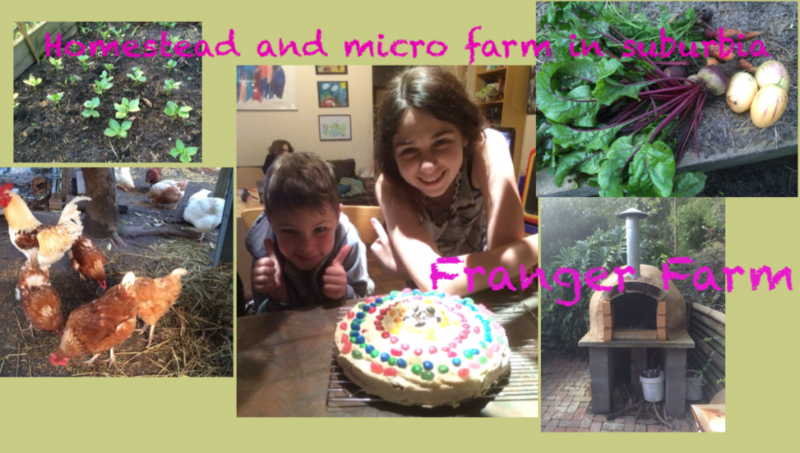 Our harvest was rubbish, but we were excited, it planted a seed of thought, maybe we could grow more of this stuff, maybe we could feed ourselves from our backyard? We threw ourselves into building a huge veggie patch ( this will be big enough to feed us, surely? erm…no.) and we grew more and more, but it didn’t feel as though we were really producing until we got ourselves some chickens. It’s the neatly packaged protein that they produce every day that makes them so amazing, the fact that you can do so much more with your veg when you have a few eggs, the wonderful sound they make in your garden and how happy they are to see you when you’re holding the food bowl. There are so many reasons to keep chickens in suburbia, here are just a few. You don’t have to spend a lot buying your chickens. They’re not very expensive to buy and house. Our first chickens were purchased from a battery farm, they weren’t ex-battery hens, rather, point of lay, that were just about to be shoved into the horrifying cage egg system. They were not very expensive but you can save even more money buy purchasing the ex-caged birds. These birds are not very old, around 18 months and are still laying well, just not productively enough for the caged egg industry. They will be very pale when you bring them home as they have spent their entire lives inside, they usually have a lot of missing feathers and they are usually scared of the big outdoors. Within weeks though, they will be looking and behaving just like chickens that have always lived outdoors. Their housing need not be elaborate or expensive. 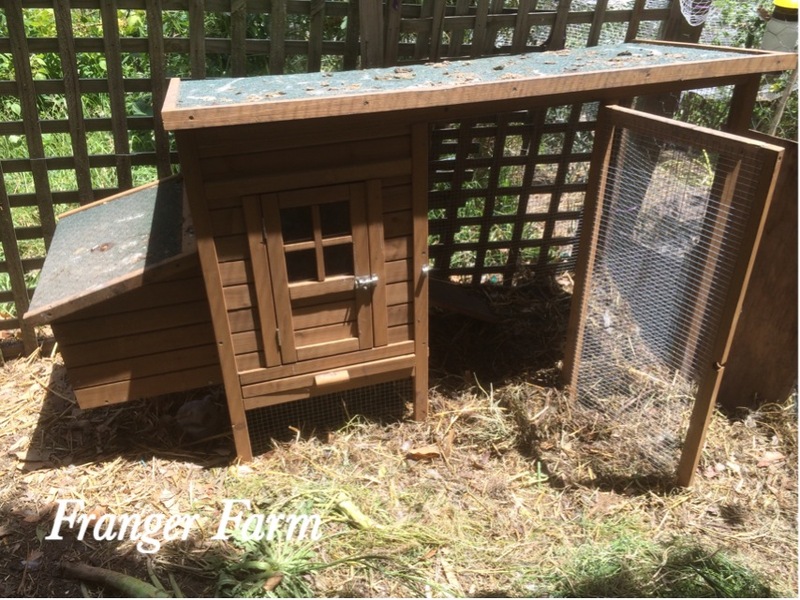 You don’t need to spend a lot on housing your chickens, we started with something similar to this and now have an array of different types of housing, we even have plans to convert our kid’s cubby house when it’s no longer in use! The most important thing is that it should be lockable at night and predator proof. 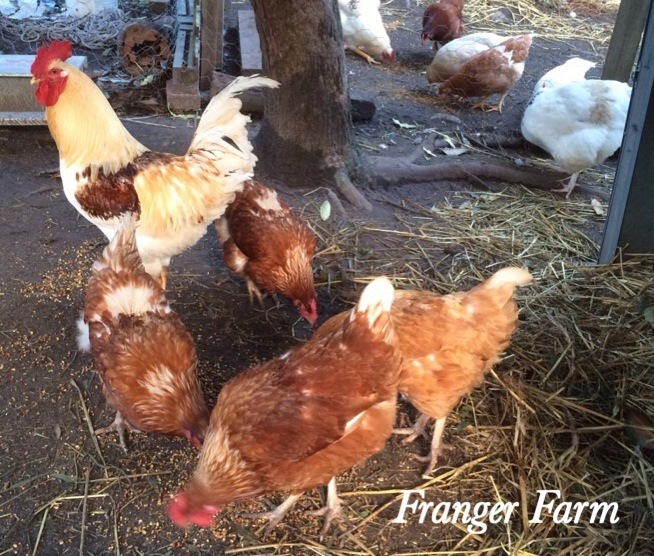 Chickens do best on a varied diet of commercial layer pellets, grain, greens and leftovers from the kitchen. You can build a run area around your coop to give your girls plenty of room to scratch and dust bath, we’ve learnt the hard way that it’s a good idea to net the top, no matter how high your fence is! your chickens will help you reduce your waste, they love nothing better than polishing off the kitchen scraps, ours are especially partial to stale bread, pasta, lasagne and bolognaise. Now may be a good time to talk about poo! If you’re growing your own veg, there’s nothing better for your veggie beds than having a home produced supply of chicken manure. 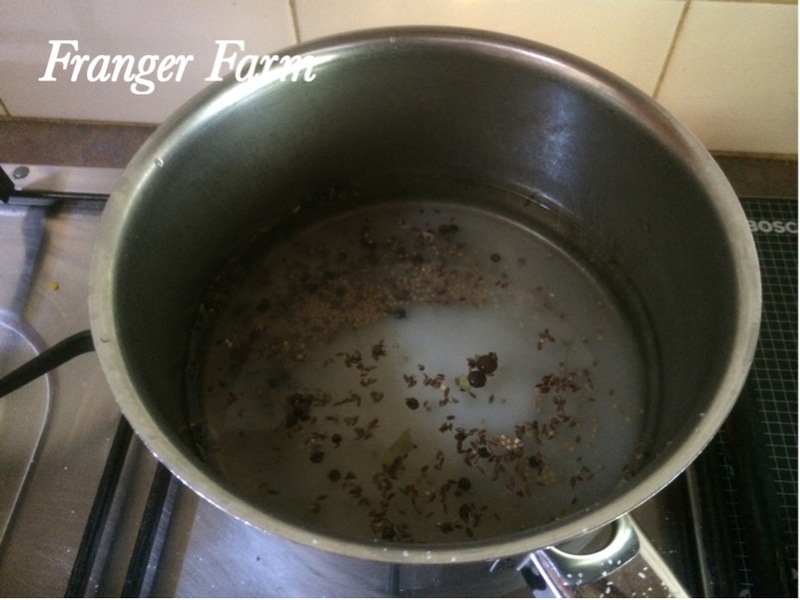 You can add it to your compost, leave it in a pile to rot down or make manure tea with it by adding it to water and using it as a liquid fertiliser. Just don’t use it direct when it’s fresh as it’s too high in ammonia and will burn your plants. Eggs! The best reason to keep chickens. 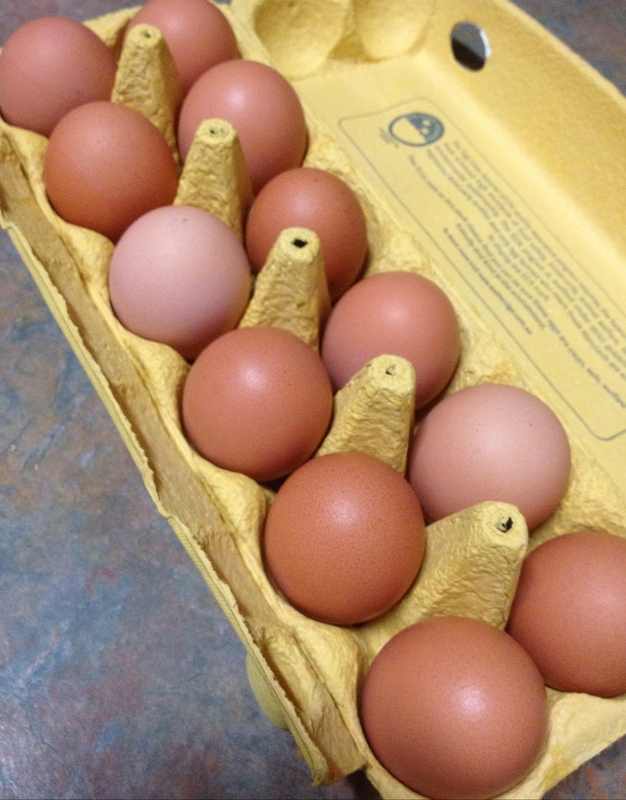 Let’s not forget the biggest and best reason to keep chickens in your backyard, those wonderful eggs. The eggs that your chickens will produce on their varied diet will be better than any eggs you’ve eaten before, if this doesn’t sell you on the benefits of keeping chickens in your backyard, I’m afraid nothing will. And a quick word on roosters. There’s no need to keep one. 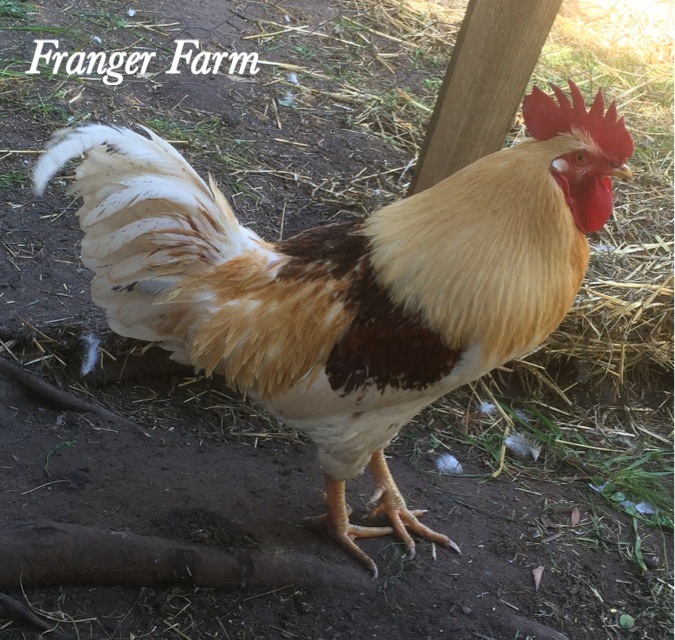 Forget everything you’ve heard about needing a rooster to keep the chickens in line or sort out the pecking order, the girls will manage just fine on their own and a rooster would be unwelcome in most suburban areas. We keep a rooster because we have begun to raise our own chickens and because we have wonderful and tolerant neighbours who put up with our “foibles”. So don’t let the idea that keeping chickens may be too noisy put you off. I could go on and on listing the various reasons that suburbia needs chickens, we’ve covered the main ones, now it’s up to you to get a few chooks and see what keeping them means to you. 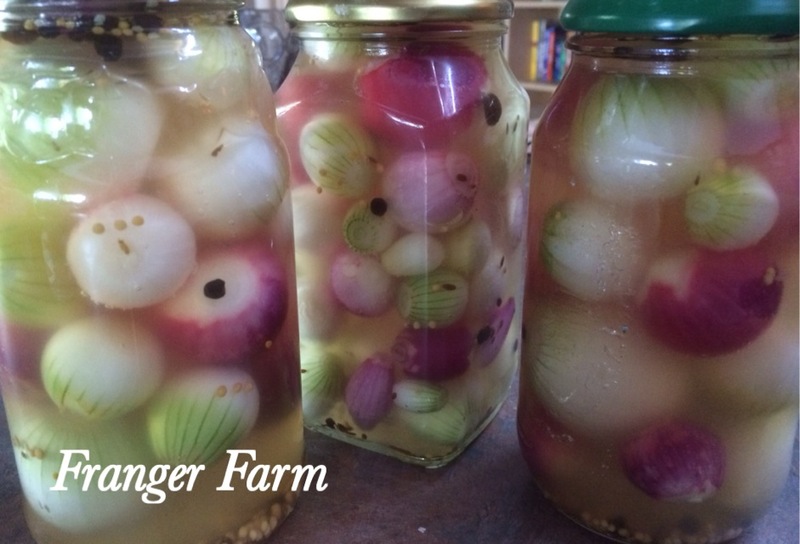 We’re big fans of pickles on Franger Farm, and nothing pickles better than an onion. 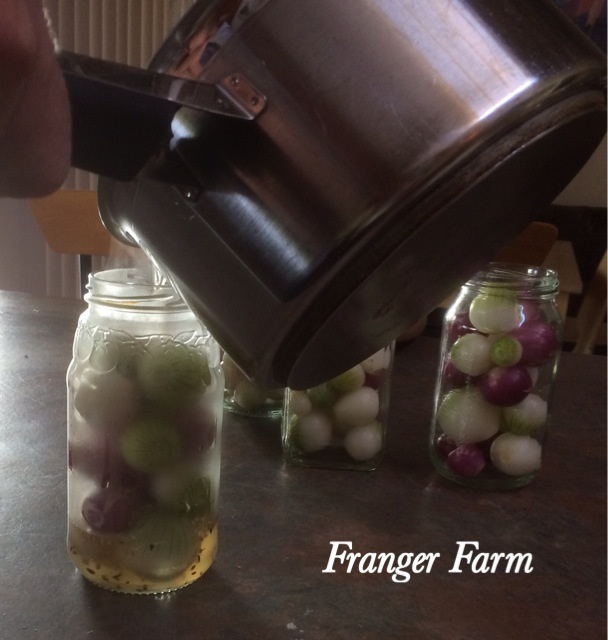 We always keep our little onions to pickle and we use this very simple recipe to do it. Drop your peeled onions into a pan of salted water with a spoonful of vinegar. Begin by peeling your onions and dropping them into salted water with a couple of spoonfuls of vinegar added, leave them for five minutes. Then drain and dry them. Boil vinegar, sugar, salt and pickling spice for 1 minute. place the vinegar, salt, sugar and pickling spice in another pan, bring to the boil for one minute. Pour vinegar mixture over onions. Pack the dried onions tightly into jars that have been boiled to sterilise them. Then poor the vinegar mixture into the jars, over the onions. Put the lids on immediately. Leave the pickles for three to four weeks. You should leave your onions for three to four weeks before opening. You can adjust the recipe to taste, adding more or less sugar or more spice depending on how ” bitey” you like your onions. We love this recipe for it’s speed and simplicity, try it and let us know what you think. 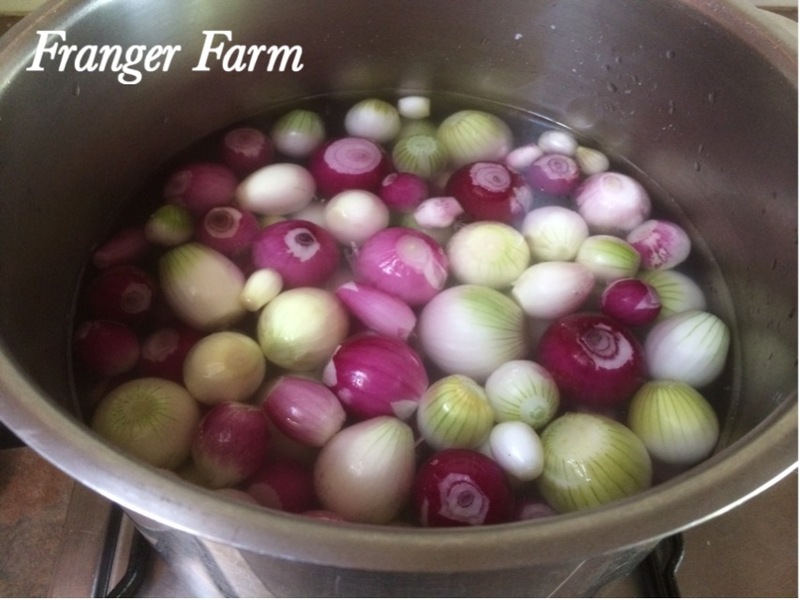 At Franger Farm, we firmly believe that almost every dish tastes better with an onion or two in it. We have a number of things that we just can’t grow enough of, and onions are well and truly on the list. Home grown onions are so full of flavour when compared to shop bought ones and can be grown in available spaces in sunny borders around the garden. 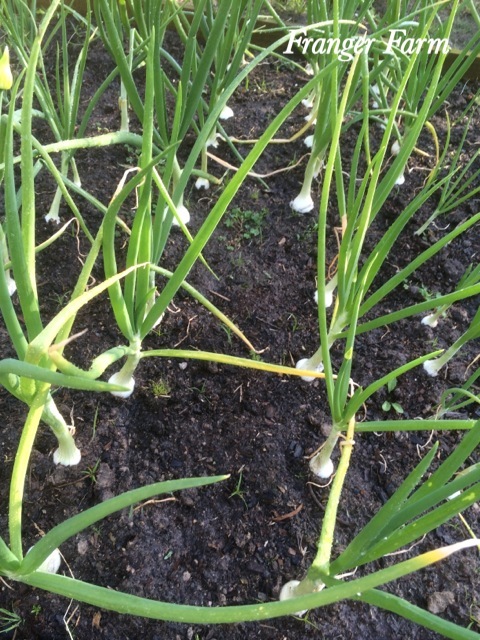 Onions need to grow in full sun in well drained soil. Onions are a cold weather crop, they can be grown in three different ways, from ‘sets’ (bulbs available from garden centres) from seed or from seedlings. We grow our onions from seed and occasionally, seedlings. Sow your seed about 2.5 to 5 cm (1 to 2 inches) apart, the same for seedlings, if you’re using sets, space them 10 to 15 cm (4 to 6 inches) apart. 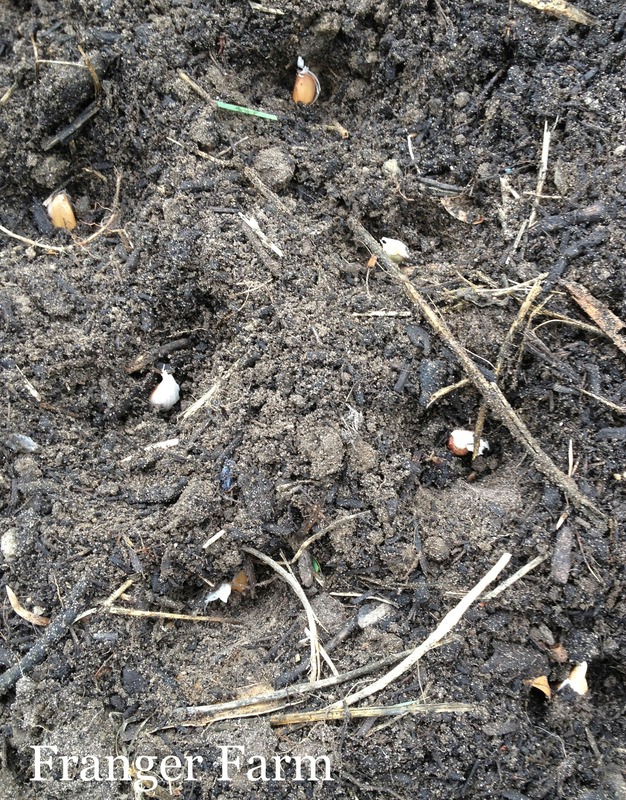 Ensure that your soil is weed free as onions are slow growing and can be quickly overwhelmed by fast growing weeds. Don’t bury your sets or seedlings too deeply or their growth will be restricted. Don’t bury your onions as they grow, the bulbs should sit proud of the soil. The tops of your onions will fall over as the onions mature. The tops of the onions will begin to die back and fall over as they mature. 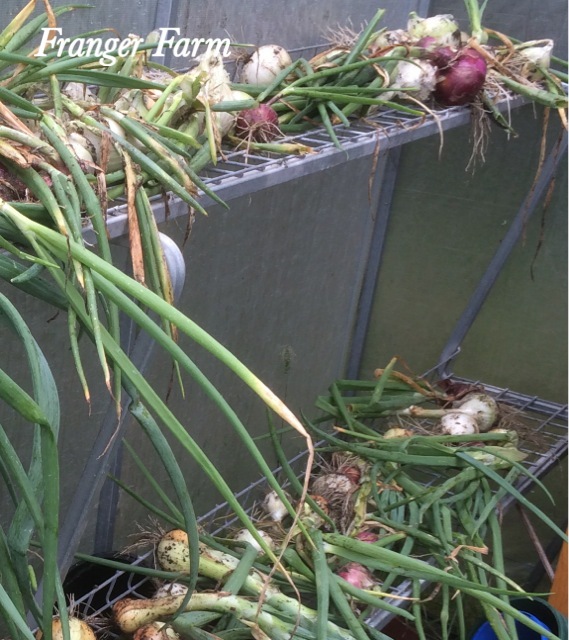 Once the bulbs have swelled nicely and the tops have died back, you can harvest your onions. Dry your onions on a wire rack or shelf. If you want to store your onions for use throughout the year, they need to be dried first. Spread them out on a wire rack or shelf so they have good airflow around each bulb. The onions are ready to store once the skins have become dry and papery. The onions will need to be stored in a cool dry area to prolong their storage life. I hope we’ve inspired you to give growing your own onions a go, but be careful, you may end up like us, chasing the holy grail of growing enough onions for your family for the entire year! How to grow : Garlic. 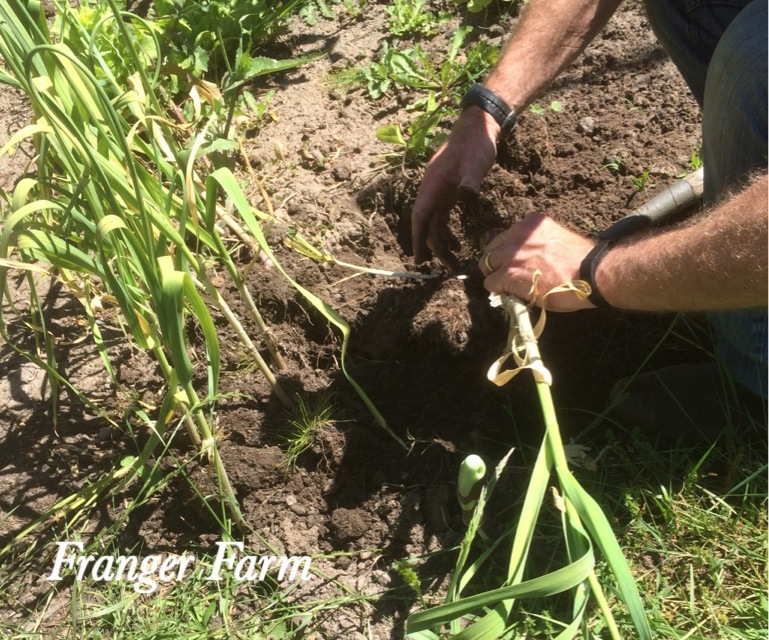 Garlic is an essential ingredient in so many of the meals we cook here on Franger Farm. Every year, we try to plant enough to see us through to the following year, and if I’m honest, we don’t always get it right. The good news is that it’s really simple to grow and we’ll tell you how. Separate your cloves for planting. 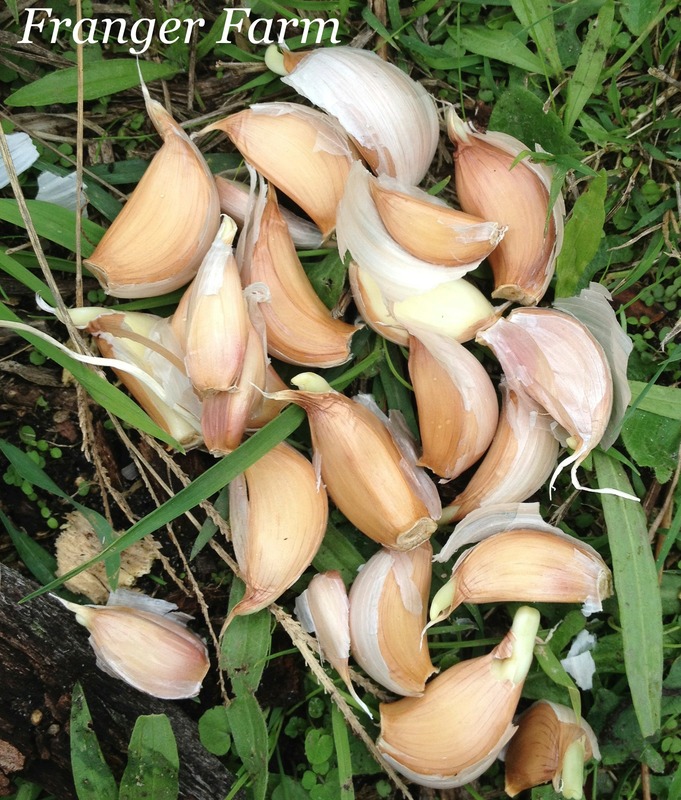 Garlic takes quite a few months to grow, it’s planted in the Autumn/Fall and harvested in late spring or early summer. You can grow an entirely new bulb of garlic from a single clove, simply separate your cloves to get them ready for planting. 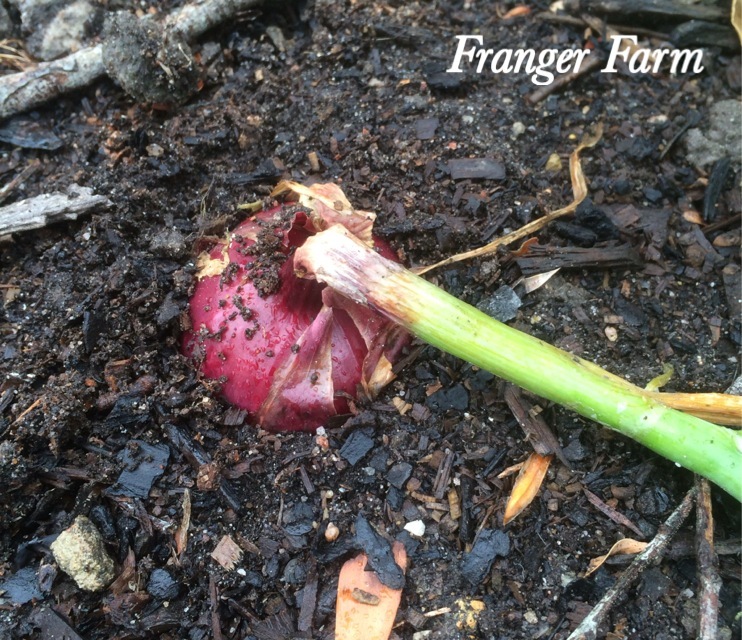 Garlic likes a sunny position in well drained soil, you should plant the cloves pointed end up about 15cm/3ins apart. It doesn’t like competition from weeds, so make sure that you keep the area around your garlic nice and weed free. 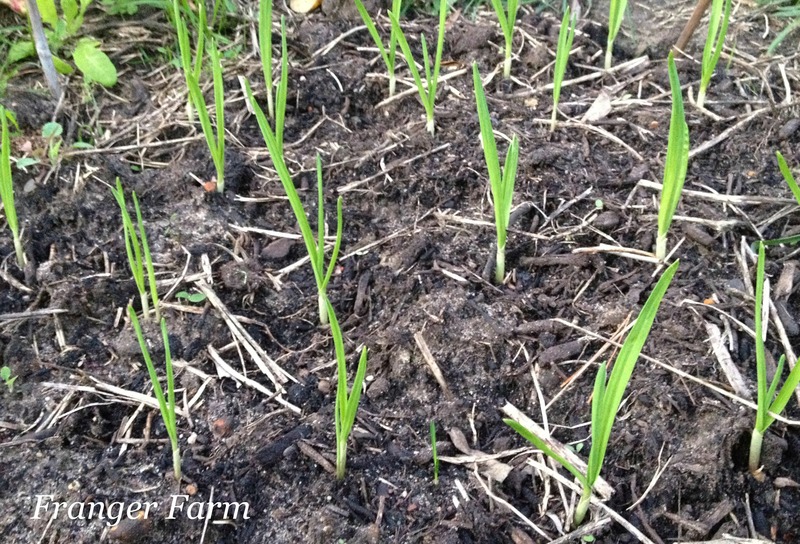 The garlic will send up shoots quickly. It won’t take long for your planted cloves to send up shoots and the bulb development to begin. It’s time to harvest in the late spring or early summer when the foliage has died back. It’s fairly easy to loosen the bulbs with a small hand fork to harvest them, simply brush of the dirt, allow to dry a little and store until needed. Brush of the dirt and allow to dry before storing. It doesn’t take a lot a room to grow quite a large crop of garlic and the flavour is far superior to shop bought garlic. Find yourself a nice little sunny spot and get growing. 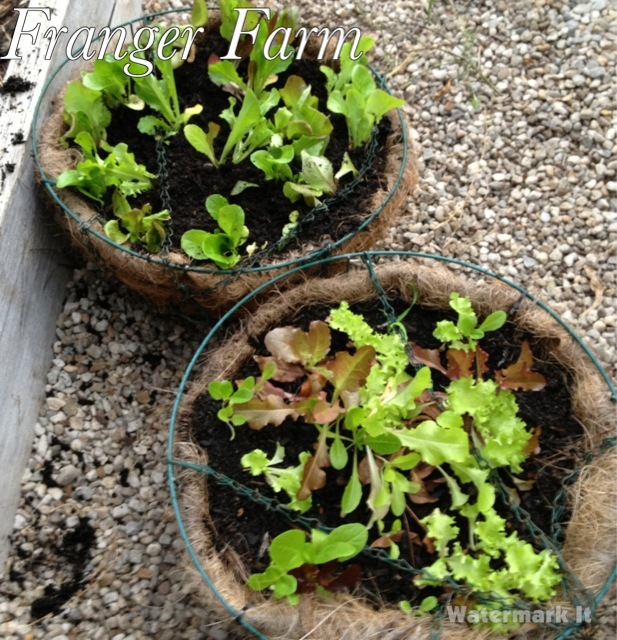 Space savers : growing lettuce in hanging baskets. 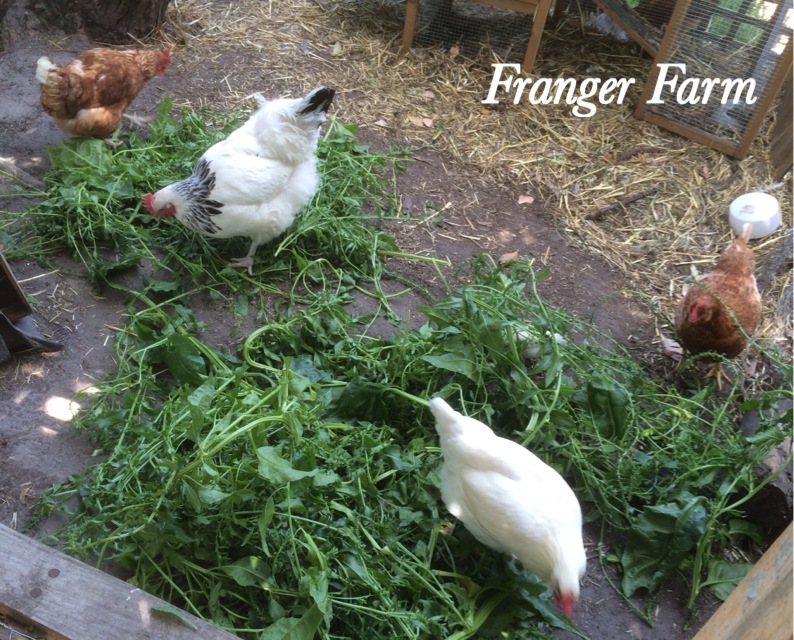 Here at Franger Farm, we are lucky to have a very large suburban block of an acre in size. A large amount of it, however, can’t be easily cultivated because it’s steeply sloping or covered in bush, we are also very enthusiastic veg growers and still find ourselves running out of space. Many of you will have much less space than us, but you can make use of the space under your eaves by planting hanging baskets with lettuce. Water storage crystals will stop your basket drying out. First, select a large hanging basket with a liner, the larger the basket, the better, as it won’t dry out as quickly, always a potential problem for pots and baskets. 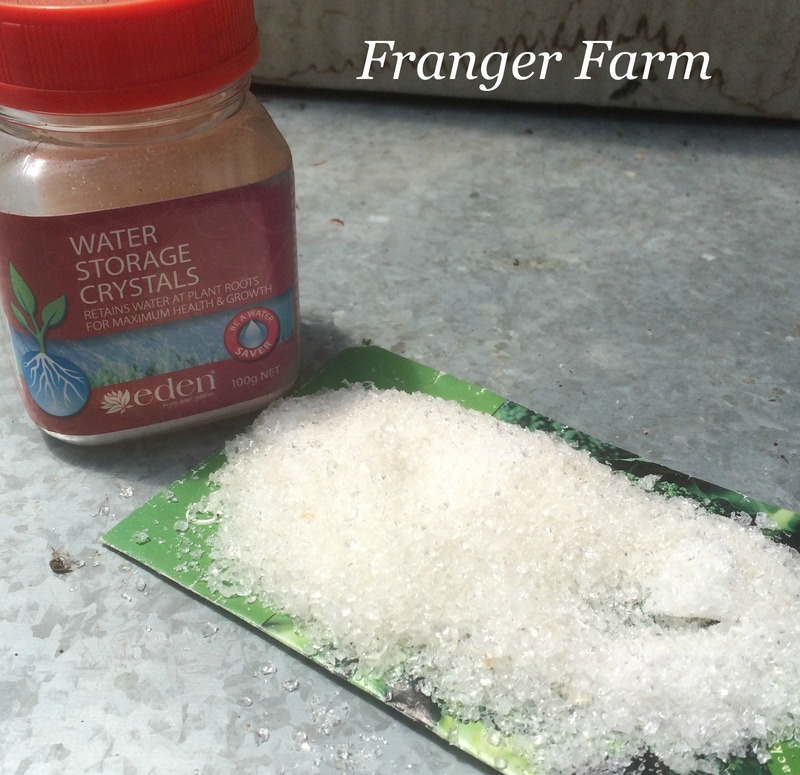 To help your basket retain water even more efficiently, you can add some water storage crystals. These swell up with water when they are wet and then release it into soil if it starts to dry out. Plant with a mixture of seedlings and seeds. Your baskets will be more productive if you add a pelletized manure to the potting mix, along with the crystals, when you plant them up. To give your baskets a really long productive time, you can plant them with a mixture of seedlings and seeds. 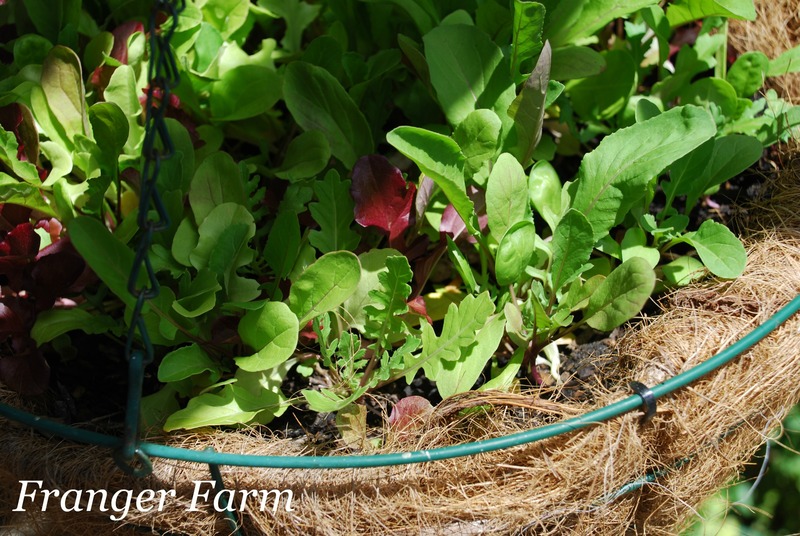 As your seedlings are nearly used up, your grown from seed lettuce should be ready to harvest. Hang close to the kitchen. Once your basket is planted, water in well and then hang on a sturdy hook. 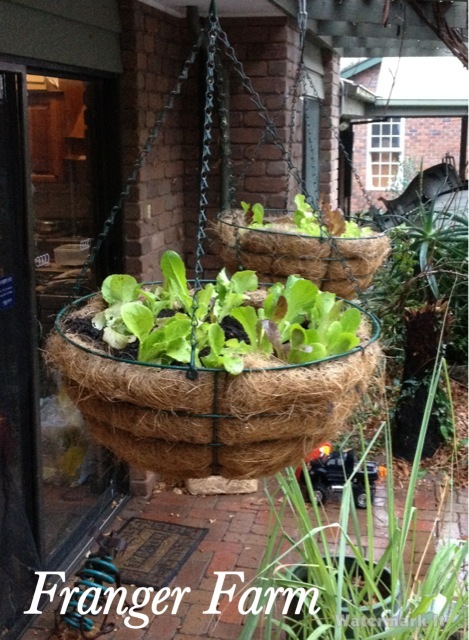 You could make life really easy for yourself and hang the basket right outside your kitchen so that you can grab lettuce quickly, whenever you need it. Give this simple idea a go, you’ll love having fresh lettuce right outside your door without having to find any extra space for it. Categories: gardening, growing fruit and veg, suburban farming Tags: growing vegetables, homegrown vegetables, space saving idea, Suburban farm. How to freeze fresh peas and beans. It’s so easy to freeze your home grown peas and beans to use all year round. So, if you have a glut, or even if you’ve bought a large amount of fresh peas and beans, here’s how to deal with them. Wash and shell your peas. 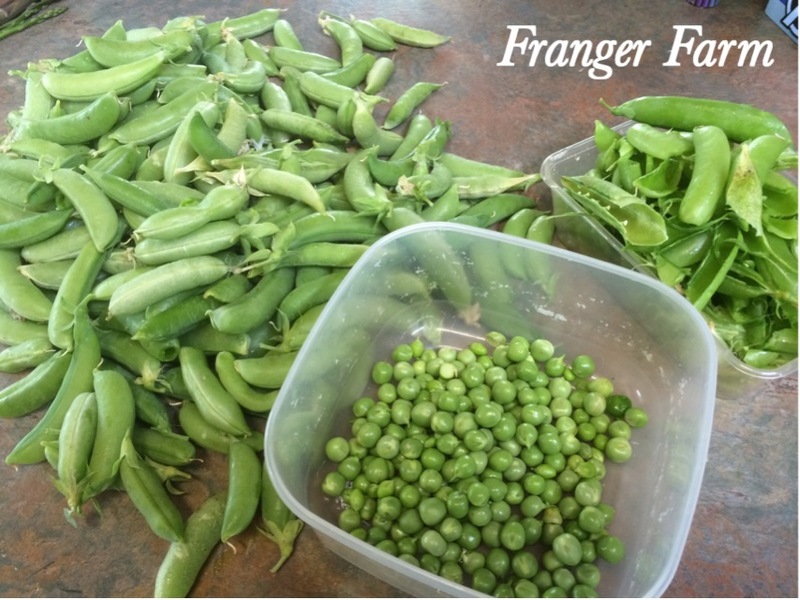 Begin by first washing and then shelling your peas, don’t freeze any that are not perfect. 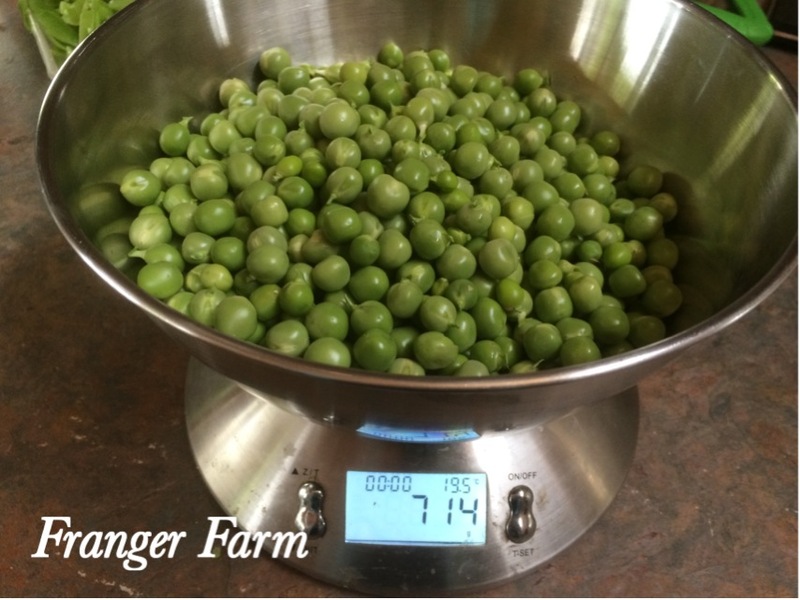 It’s best to begin this process as soon as you pick your peas to make sure that you freeze them when their flavour is at it’s best. Once you have shelled all your peas, you need to prepare a pan of boiling water and a bowl with ice water in it. Put the peas into the boiling water and blanch for no longer than two minutes. Drain the peas and immediately transfer into the bowl of ice water. This cools them quickly and stops them from cooking any further. You should leave them in the ice water for a further two minutes. Bag the peas for freezing. 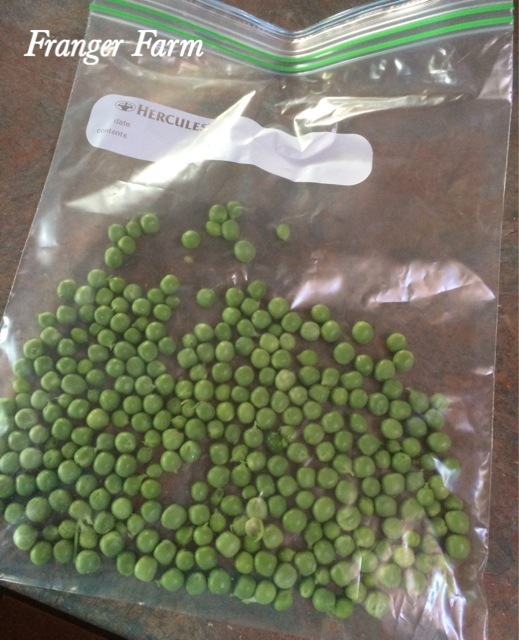 Drain the peas again and put them in sealable or zip lock freezer bags. Don’t be tempted to over fill the bags, they will freeze better if they can be spread out flat in the freezer with the peas separated. If possible, use the quick freeze function on your freezer, the faster they are frozen, the better they will taste when they are cooked. Once they are completely frozen, they no longer need to lay flat and can be stored in your freezer as normal, ready for use throughout the year, as tasty as the day they were picked!